Holding a Guinness certificate with my name on it! After returning from Shanghai unsuccesful, Brian Spotts decided it was high time that he officially break another world record. So, without much pomp or circumstance, he organized an assembly at his sons' elementary school in northern Colorado in March, 2015. 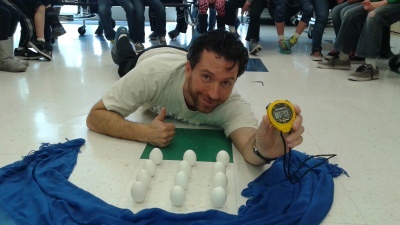 It took a few minutes to find the right surface, but after just two attempts, he successfully balanced a dozen eggs in 1 minute and 6 seconds, a new world record, and a personal best! The cool thing about this record was that the kids got to watch it! They had never gotten to see their dad break a world record, so this was lots of fun for all of them. Not only that, but this was at their elementary school. For weeks, the boys would tell their friends, "Right there by that green square in the cafeteria. That's where my dad broke the world record!" This time, all of the appropriate documentation happened, and Brian received a Guinness certificate declaring him "Officially Amazing!" His name on a certificate, and later in the Guinness Book of World Records (Super Humans, 2016). This was Brian's goal from the start. Finally! In December of 2015, Brian Spotts had the opportunity to travel to Talequah, Oklahoma, to participate in a world record breaking event. While in Shanghai, he had met another world record breaker named Brian Jackson, who wanted to have a big event for his final world record attempt. So the Spotts took a rode trip to Oklahoma. 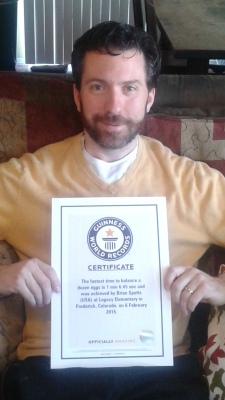 On December 12, 2015, Brian Spotts set a new world record, Most Eggs Balanced in a Minute While Blindfolded (4). 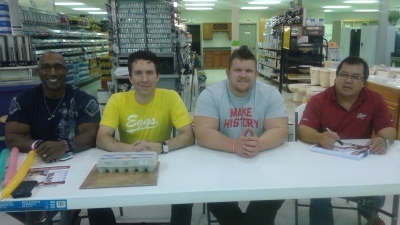 His new friend Smiley Elmore Jr broke the record for Most Weight Curled in One minute, and J.D. Anderson broke the record for Most Steel Bars Bent over the Head in One Minute. It was all part of "A Force to Be Reckoned With". It was tons of fun participating in a world record breaking extravaganza in the United States of America.